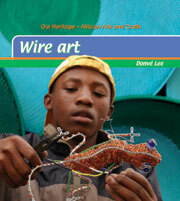 Provides children with information about wire art as an aspect of their heritage and culture. This book contains a Glossary and an Index. What do you need to become a wire artist? Provides children with information about art, craft and culture as aspects of their heritage. Why is craft work popular today? Provides children with information about paper craft as an aspect of their heritage and culture. Provides children with information about bead work as an aspect of their heritage and culture. Provides children with information about basket work as an aspect of their heritage and culture. Do we still need baskets? If you can bend it, you can weave it! Provides children with information about clay craft as an aspect of their heritage and culture. Provides children with information about recycling as an aspect of arts and crafts. Provides children with information about textile art as an aspect of their heritage and culture.